There are many reasons to give to the High Line: whether it be our innovative industrial reuse design, the experience of walking through a wild garden while bumped up against historical and contemporary architecture, or our boundary-pushing public programs and art. And some donors are inspired by something more specific: the way the benches on the Diller – von Furstenberg Sundeck slope up from the revivified train tracks, or protecting the species of pollinators who live on the park. For Tom and Marian, it was the patch of Whitespire gray birch trees in the Gansevoort Woodlands. For Tom’s birthday this year, Marian pledged years-long support of these regal beauties in his name. 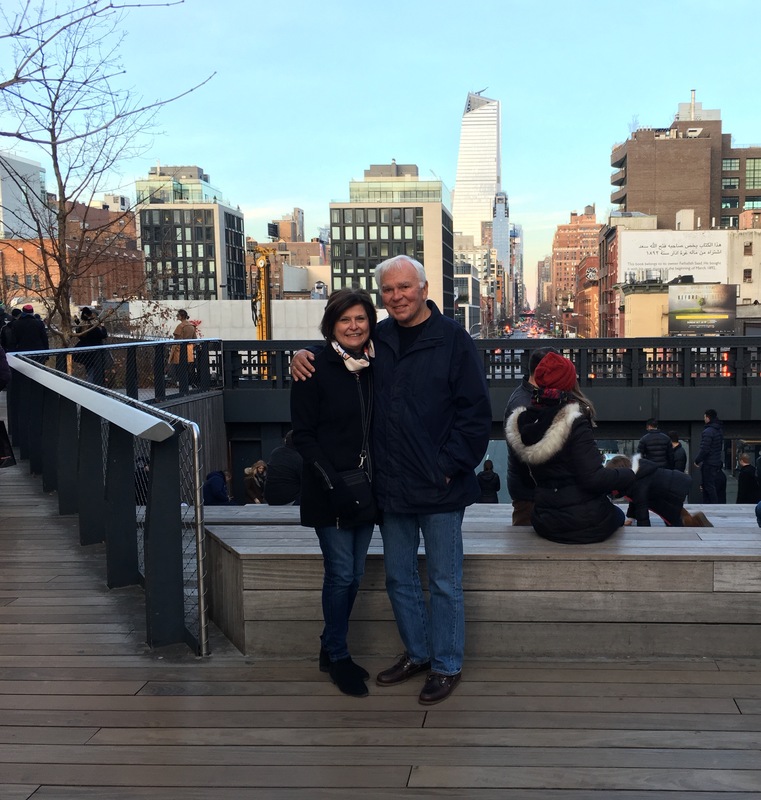 We asked Tom and Marian a few questions about their appreciation of this unique public space, and why a gift to the High Line can also be a great gift for someone you care for. What was your first experience together on the High Line? Tom spent his professional career on Wall Street. He has two daughters that live in Manhattan. We travel to New York several times each year. We have many favorite places in New York, including Odeon, Grifone, lots of jazz clubs, and the High Line. Tom’s daughter, Heidi, suggested that we all walk the High Line together some years ago. We immediately fell in love and, ever since, there is not a trip to New York that doesn’t include the High Line. We cherish many special memories walking together, with Heidi and her husband Joe, along with our other daughter, Mariah. What was the most memorable experience—anything particularly impactful, visually catchy, or unexpected? We love the amazing collection of architectural buildings, the various materials used in the buildings and on the High Line. It’s a gorgeous mixture of natural plants and man-made materials. The visual palette surpasses any place we have been on the planet. The combination of buildings, low rise vistas, sunlight, shadows, combined with the judicious use of plants is glorious. The birch trees are what is called monoecious, meaning they can have both male and female flowers on the same tree. I think, then, that it’s fitting that a wife gifted this particular tree to her husband for his birthday. Why the birch trees specifically for you? The beauty of the birch tree patch amidst the architecture really leaps out at you. We were immediately drawn in. The white trunks against the steel, stone, and wood are beautiful and sensual. We may replicate the birch patch in our own garden. You’re not living in New York at the moment—why continue to give to the High Line? We believe that the High Line is a national treasure to be preserved and we’re happy to be part of it. Any new, favorite plants in St. Louis you’d like to share with us? St. Louis is blessed with another national treasure, the Missouri Botanical Garden. They have an installation of tree stumps, ”root balls,” that are just striking. The roots resemble a natural lace. We’re also going to replicate this in our own garden, too. I know you still have family here. When will you next visit New York, and what are you most looking forward to? We’ll be in New York in December for family, the High Line, theater, food, shopping, and some jazz! A big THANK YOU for all you are doing at the High Line and for its preservation.